I have been using coir fiber for many years and I love it- mulching and for propagating. it's compact and easy to store until you need it. I try to keep a few bricks on hand all year. Some companies run out, so I try to stay ahead of them. Many companys online sell it now. It's beome easier to find, but also more expensive. Description: Coir mulch, comes compressed in a small block but expands when water is added. Green/sustainable because it's made from coir not from wood. 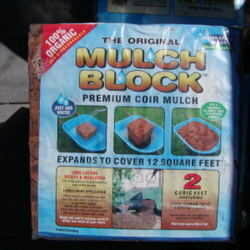 I have a bad back and can't handle the bags of mulch because they're too heavy and awkward, so these are a great option for me (1 block when expanded with water mulches the same area as a 2 cubic foot bag of mulch). Unfortunately they're also much more expensive than the bags of mulch and it takes more time to spread the mulch, but for me it's well worth it to save my back. I also like the fact that it's more environmentally friendly than wood mulch.